This build fixes a bug with the Range Card "Click" values in mils. Corrected my error saying cdms did not transfer between ipad and iphone (they do). This is definitely an advanced app and not for the faint of heart. I read the books by Bryan Litz and I highly recommend those books to understand all the variables and the impact. The user interface is clunky and it makes it a bit annoying when used, but you are getting the application for shooting not based on looks. The CDMs are a bit expensive (1.99 each), but if they save you a few bullets you will come out ahead. I wish they had a way to buy a group of bullets at a discount such as all berger bullets in 30 caliber (or select x amount at a discount such as 10 bullets for 15 dollars). The tables have problems with tables in the ipad. No issues with the view in the iphone 7s. 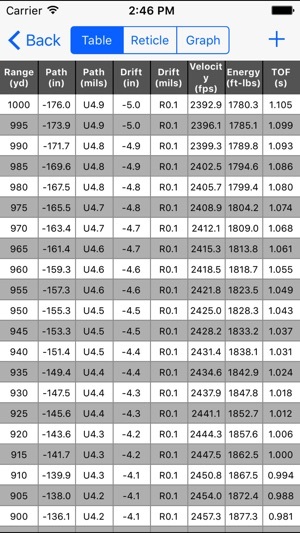 At this point I give it three stars for the issues with the ipad not correctly formatting the tables. I think ballistic AE is a better app for more casual shooters who want basic G1 and G7 profiles and who remain out of the transonic due to the slicker interface/UI look. The CDMs are a welcome addition and those who shoot at ranges through the transonic then this is the application you will need. This is the best ballistics app out there and worth every penny. While the user interface is a little clunky, it’s still miles above any comparable app. As a hunting guide, I need to have data for each clients gun and ammo available offline. 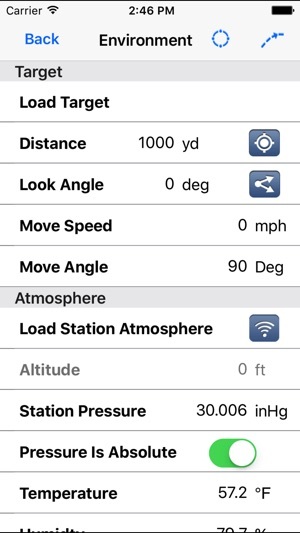 This app makes that easy and convenient with an extensive library of factory loads to choose from. 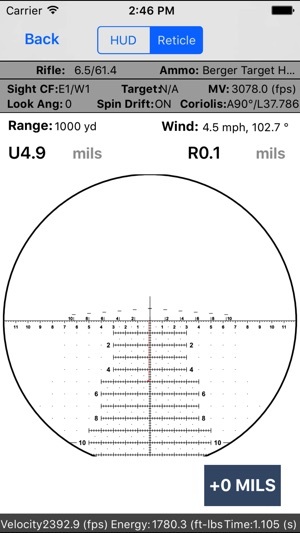 I really like the reticle view feature for being able to show clients exactly what the reticle looks like and where to apply a wind hold. One issue that I’ve found is with importing the local atmospheric conditions. 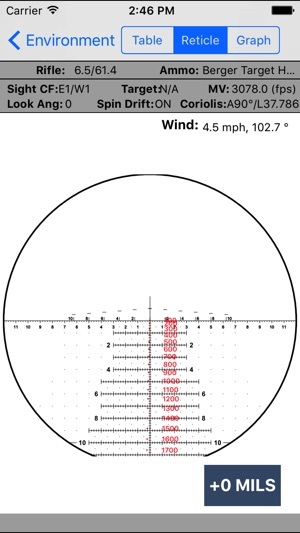 Even with the “Disable Wind Population” turned on (so that the local station values don’t mess up my preferred 10 MPH / 90* wind value), I am still getting local wind populated into my chart and One Shot views, so I have to go back and delete the imported wind and manually enter 10 MPH / 90* winds. 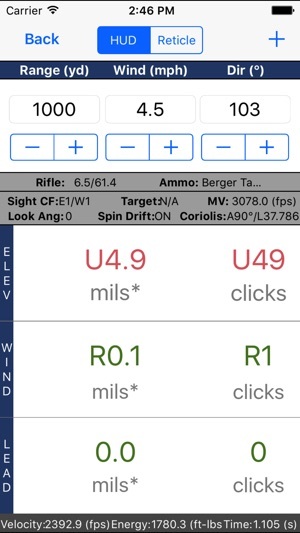 Overall, it’s a great tool and I’d highly recommend it to anyone looking for a phone based ballistics calculator. Edited: At first I really disliked the app. I had 3 main issues with it, 1 of which was user error. The second issue was the user interface, which is still not very good, but workable. The third issue is that it doesn’t work right on the I-pad. Brass tax. If you want quick results, this is not your app. You have to be willing to dive into the users manual (available online) and work past some confusing set up criteria. But if you want the best data and you’re willing to spend some time getting to know the app, you’ll be very pleased, so long as you aren’t on an i-pad.